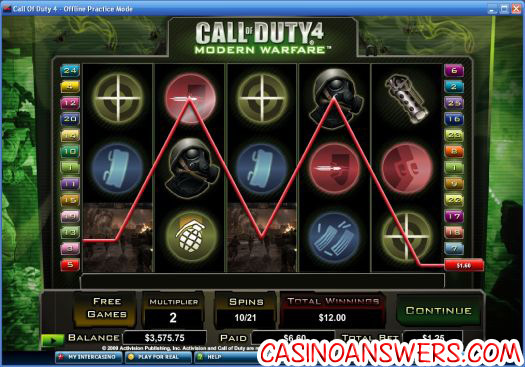 Call of Duty Video Slot Guide & Review - Casino Answers! The Call of Duty 4 slot machine game is a 5-reel, 25-line video slot that you can find at Cryptologic casinos such as VIP Casino. It’s based on the 2007 best-selling video game for Xbox 360, Playstation and Wii, Call of Duty 4: Modern Warfare. In the video slot, you may play from 1 to 25 lines. Payline wins are multiplied by the bet per line. The highest win amount is paid on each selected line. Scatter wins are multiplied by total bet, and then added to the line wins. Bonus game wins will be added to the scatter and line wins. Winning combinations pay from left to right with the exception being the Scattered logo. Soldier (wild) substitutes for all symbols except Scatter. The prize will be doubled when the Soldier symbol substitutes in a winning combo. One of the most creative features in Call of Duty 4 is the Exploding Symbols. In the main game, a symbol may explode and become a Soldier symbol. When this happens, a grenade will roll onto the screen and blow up the original symbol, thus giving you a win. If you’re a fan of the Call of Duty series in addition to online casinos, you’re definitely going to want to try this Call of Duty 4 slot game. It may not quite substitute for playing the game itself, but the idea is to play for money, not to play for gameplay value. We recommend you play Call of Duty 4 at VIP Casino. What are the minimum and maximum bets in the Call of Duty video slot? You can bet as little as $0.01 on a single line or all 25 lines ($0.25). The most you can bet on a single spin in Call of Duty 4 is $10 per line, or $250 if you want to play on all 25 lines. We strongly recommend you play all 25 lines, as you wouldn’t want any winning combos to slip through the cracks! What can I win in the Call of Duty 4 video slot bonus game? 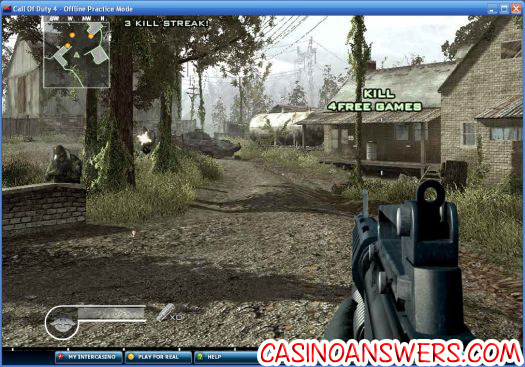 In the Call of Duty 4 feature, you can win up to 4 free spins (with a 2X multiplier) for every enemy you shoot. You’ll get even more for headshots! If you’re able to kill five in a row, you’ll be awarded an Airstrike, winning you an even better multiplier (up to 5X). You can also win bonus prizes if you destroy other objects on the screen. Is there a Call of Duty Slot Machine Game? What slot machine games are there? What video games have been turned into slot machines?